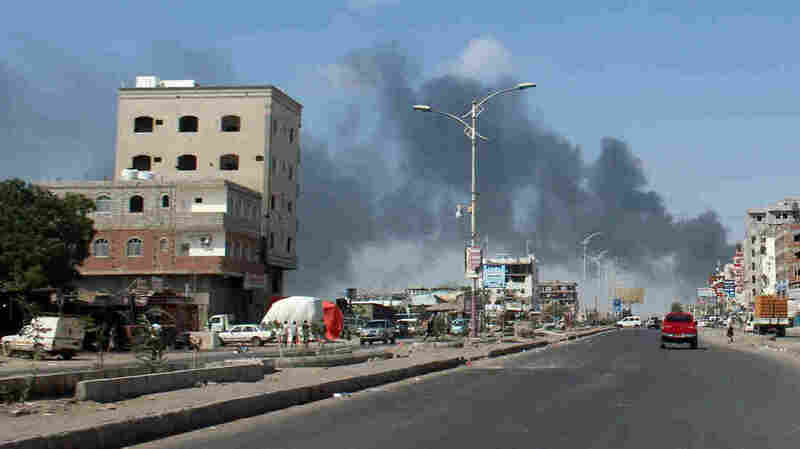 Yemen Separatist Crisis: Southern Transitional Council Seize Most Of Aden : The Two-Way Intense fighting between the forces of the two former allies has left the city's presidential palace surrounded — and the cabinet, including Prime Minister Ahmed Obaid Bin Daghar, stuck inside. The South Yemen flag, for years a relic of the country's fragmented past, billowed brightly once more above pickup trucks and tanks patrolling the key southern city of Aden on Tuesday. Black clouds of smoke billowed across the city's skyline, too. 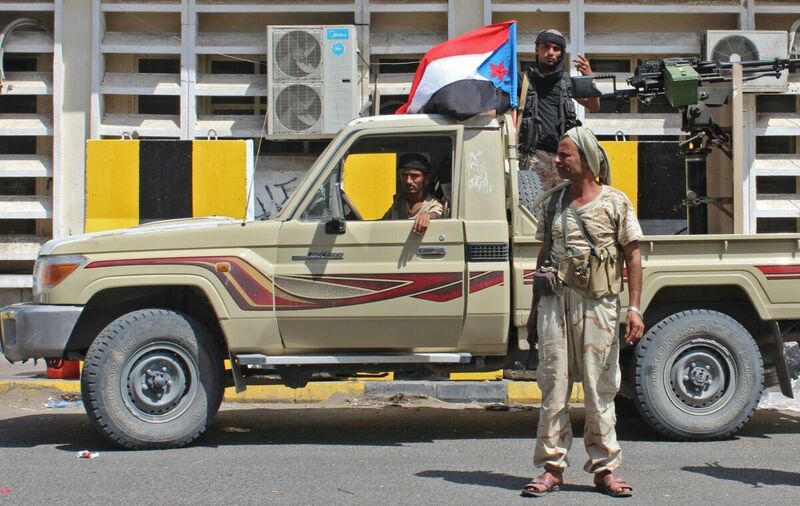 Separatist fighters fly the old, pre-unification flag of South Yemen above their pickup as they patrol Aden on Tuesday. Yemen's internationally recognized government has accused the separatist Southern Transitional Council of orchestrating a coup as it has moved closer to controlling the government's de facto capital. Troops loyal to the Southern Transitional Council, a separatist group seeking to reclaim southern independence, have seized most of Aden from the forces of Yemen's internationally recognized government. The intense fighting, which erupted Sunday between the two former allies, has left the presidential palace in the city surrounded — and the cabinet, including Prime Minister Ahmed Obaid Bin Daghar, holed up inside. Bin Daghar and Yemen's president-in-exile, Abed Rabbo Mansour Hadi, have described the violence as a coup against the country's proper authorities. The STC, for its part, claims it delivered Hadi the ultimatum to sack his senior officials because those officials have allowed rampant corruption to badly erode public services. Though the violence between them calmed to a degree Tuesday, the International Committee of the Red Cross reports the fighting — which included "heavy guns and light artillery" — has claimed at least 36 lives and left another 185 wounded. The past few days' gunfire also claimed another, less tangible casualty: the tenuous alliance shared by the southern separatists and Hadi's government, forged in the opening days of the war against the Houthi rebels. 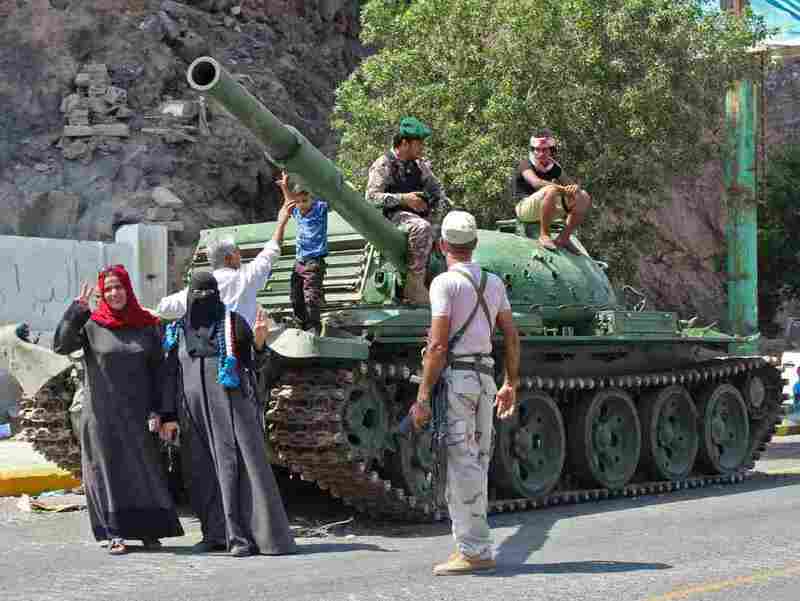 The Shiite rebel group overran much of the country's northwest — including the capital, Sanaa, where it seized power from Hadi's regime in 2015 — but it failed to make inroads in Yemen's southern regions, mainly due to the uneasy partnership shared by Hadi and the separatists. Now, that partnership appears shattered. Smoke reaches skyward Tuesday in Aden, the Yemeni government's de facto capital. Since clashes began between government forces and southern separatists Sunday, several dozen people have died and dozens more have been injured. And the broken pact threatens to undermine still another, the Saudi-led Arab coalition that has been conducting an airstrike campaign intended to dislodge the Shiite Houthis since 2015. Saudi Arabia backs Yemeni President Hadi, who has stayed in Riyadh since his ouster. At the same time, a key member of that coalition, the United Arab Emirates, has closely backed the STC with an eye toward maintaining crucial oil shipping routes in Yemen's south. On Tuesday, coalition members projected a united front. "The coalition again requests all parties to speed up the cessation of all clashes immediately and the end of all armed manifestations," the group said in a statement translated by the state-run Saudi Press Agency, "and the coalition confirms that the it will take all necessary measures to restore security and stability in Aden." The U.S., which has at times supported the Saudi-led airstrike campaign with logistical and targeting support, echoed the coalition sentiment Tuesday. "We call on all parties to refrain from escalation and further bloodshed. We also call for dialogue among all parties in Aden to reach a political solution," State Department spokesperson Heather Nauert said in a statement. "The Yemeni people are already facing a dire humanitarian crisis. Additional divisions and violence within Yemen will only increase their suffering. A political dialogue represents the only way to achieve a more stable, unified, and prosperous Yemen." Supporters hop on a tank operated by Southern Transitional Council separatists, as they patrol near the presidential palace in Aden on Tuesday. As the State Department noted, Yemen's civilians — caught for years between these shifting, warring factions — are facing what aid groups are calling the "world's worst humanitarian crisis." Between vast outbreaks of cholera and diphtheria, desperate food insecurity and a crumbling infrastructure incapable of handling either, the ICRC says now "80% of the population need aid to survive." As for Hadi's government, narrowly holding onto a foothold in its de facto capital, the future appears far from clear. Reuters reports that STC officials say Prime Minister bin Daghar and his cabinet are in negotiations to flee the city — but sources within bin Daghar's deny that he has any intention of leaving.